Women are paid 80 cents to every dollar paid to men, according to an April report from the National Partnership for Women & Families. But if you break this figure out by race, education level and experience, you’ll find that the wage gap is not the same for all women. Black women have to work an extra eight months to make the same wages as white male counterparts made in 2017, meaning that Aug. 7 was Black Women’s Equal Pay Day. Black women made an average of 66 cents on the dollar paid to white men in 2017, regardless of education, experience and location, according to a recent analysis by the Economic Policy Institute. Slow wage growth, class inequality and gender and race bias all factor in to the wage gap for black women in the U.S. The institute has also looked at data to debunk common myths about inequality. One is that education would narrow the wage gap for black women. However, black women make less than men at every level of education, even when working the same jobs as men, the analysis found. Another myth is that women choose lower-paying jobs and careers than men. To assess this, the institute measured occupational segregation, which Wilson explains is how people of different demographic groups are more likely to be concentrated in certain parts of the workforce. The analysis focused on changes in occupational segregation over time. There has been only a slight reduction in occupational segregation from 2000 to 2016, meaning that black women are still more likely to be employed in lower-paying jobs than white men, the analysis found. “Sometimes it is choice, but often not a complete choice,” said Wilson. Racial, gender and societal biases can limit opportunities for black women. Some careers, especially those still dominated by white men, can be difficult to break into, especially as a woman and a person of color. In her practice as a financial advisor, Zaneilia Harris looks to empower all women with a financial plan, and often helps her clients negotiate salaries and think about their career trajectory. Harris hopes that the trend of disruption continues and encourages more women and people of color to pursue careers that interest them. There’s an economic cost to inequality, even for those who do not feel discrimination, said Wilson. Economic growth is generated by how much money people have to spend, which is driven by income. Continuing economic growth is beneficial to everyone, said Wilson. Even though the economy is currently doing well in many areas, slow wage growth has been a sore point. In recent years, the gap has widened instead of narrowing. “The day is later this year than it was last year,” Wilson said. In 2017, Black Women’s Equal Pay Day was July 31. The wage gap is still apparent when you control for either gender or race. Black and Latino men make less than their white and Asian counterparts, the same gap as is seen in women’s earnings. In addition, women make less than their male counterparts for every demographic, according to data from the Bureau of Labor Statistics. Quarterly data from 2017 to 2018 has shown that while earnings have gone up slightly for all, the gaps in wages have remained and in some cases have gotten worse. There are several things than can be done to help all women, said Joi Chaney, campaign manager for Equal Pay Today, a campaign launched by the Tides Center, a philanthropic partner and nonprofit accelerator that focuses on social justice. 1. Close enforcement loopholes. Reducing barriers to courts and updating legislation such as the Equal Pay Act, which was passed in 1963, will help, Chaney said. 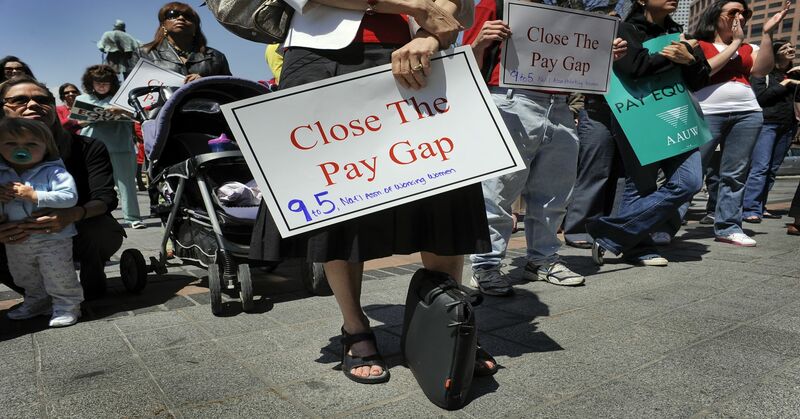 One proposed act is the Paycheck Fairness Act, which would make critical changes to help workers and hold employers accountable, according to the American Civil Liberties Union. The bill was introduced in the House in April 2017, but has since stalled. 2. Fix data collection. The Equal Employment Opportunity Commission collects a wealth of information about the workforce, but pay data are not included. This makes it much harder for the EEOC to discover pay discrimination, said Chaney. 3. Get rid of policies that don’t benefit anyone. One such practice is asking for a prior salary to determine wages at a new job, Chaney said. If you’ve been underemployed or had depressed income in the past, this practice can keep you from making more. 4. Increase the minimum wage. An increase in minimum wage would be beneficial to many workers and women, Chaney said. In addition, she said that raising the minimum wage for tipped workers would improve working conditions for women and women of color, who make up a majority of tipped workers. Equal Pay Day is beneficial because it brings awareness to the issue, said Wilson.